There is no getting away from it – 2015 has thus far been an outstandingly profitable year for betting on horse racing, especially for those SBC members following some of the top racing tipsters we recommend. Evidence of this can be found in our extra special ‘Racing Tipster Profit Report’ released earlier this week, which contains the full results details for 29 of the very best racing tipsters that proof their advice to us. All 29 have been reviewed in-depth by our team of experts at various points over the past 9 years, with 11 of them achieving a much sought-after ‘Hall of Fame’ award for their tipping prowess! 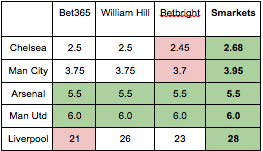 …And so to help illustrate the kind of profits these top tipsters are making, I wanted to share some key stats on just 4 of the 29 based on their 2015 record to date, including 1 that provides tips for free. Each of the 4 have great long-term records but have really stepped it up a notch this year with a combined profit of £5,226 AFTER fees. This profit figure is based on using a £2000 Betting Bank for each tipster which I have used below to illustrate just how much real-world profit you would have made with them in 2015. Needless to say, you don’t need £2000 to get started (far from it) but it is a good comparison figure to work from – if you would prefer to follow with a £500 bank for example, simply divide the figures by 4. SBC Member Cost: £120 for 3 months. Tipster Notes: Since 2014, this tipster has made an eye-watering betting bank growth of 360% – making him one of the best for Return On Capital. £2000 invested on the 1st January 2014 would now have grown to £9,200 over this period. SBC Member Cost: Free as the wind! Tipster Notes: One of the most in-form tipsters we currently track, having made a profit in each of the last 6 months of at least 20% ROI. Tipster Notes: One of the longest-running tipsters out there, this service started out in July 2006 and has made a 951% bank growth figure in 9 years. If running 4 different £2000 betting banks for each tipster (a total of £8000), for 2015 alone you would be sitting on a return of £6456.80 from the first 7 months of the year. Even taking into account tipster fees for all 4 so far of around £1280 (although this may work out at considerably less if using the SBC member discounts), you still have a clear profit of £5226 to show for your work. Ever mindful of the need to take into account tipster subscription fees, you can also find in our Racing Tipster Profit Report a comparative table outlining the total profits for each service AFTER fees have been deducted. Helping you weigh up the best racing tipster for you! Hopefully some of the information in today’s article will help outline just why 2015 has been such a successful year for so many of the racing tipsters featured in our report…. AND just as importantly how this can help you make money betting on the sport!If you want to know more and gain access to our special Horse Racing Tipster Profit Report PLUS our detailed and independent reviews on each of the 29 tipsters included, make sure you sign-up for a Smart Betting Club membership today. We provide instant access to our members only service as soon as you start your subscription with us. You can also join with the peace of mind that comes from our risk-free money back guarantee, whereby if for any reason you do not like our service, you can obtain a full refund within your first 30 days with us. Giving you everything to gain and nothing to lose by trying out our service. Subscribe To The Smart Betting Club Now! 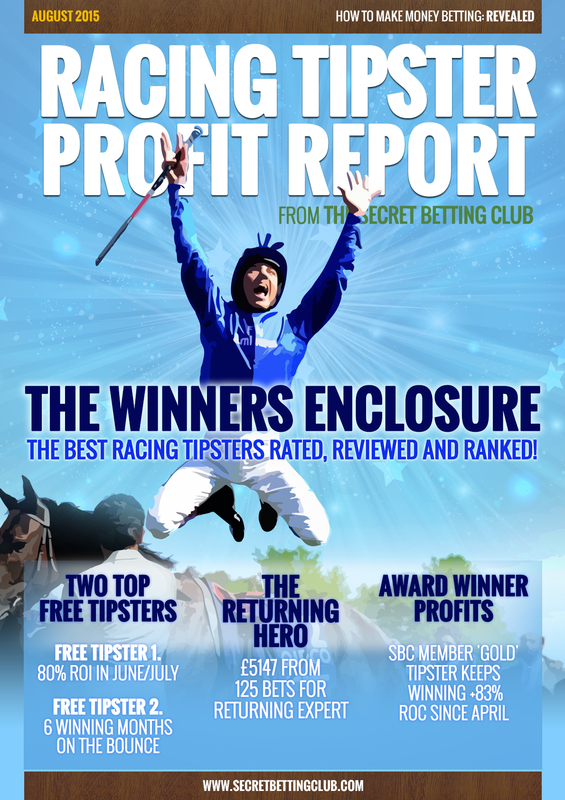 The latest Smart Betting Club Tipster Profit Report is out now and it’s a special Horse Racing edition – featuring the latest results for 29 of the best expert racing tipsters available. 2015 has seen unprecedented success for many of the racing tipsters featured in the report, hence why we have termed it ‘The Winners Enclosure’ because if you want to make money betting on horse racing, there really is no better place to start! 1. The Free Tipster up 80% ROI in June & July alone. Phenomenally profitable. 3. The SBC ‘Gold’ award winning tipster boasting 83% betting bank growth since April. 4. The‘Returning Hero’ back from a break up £5,147 profit from his last 125 bets. Plus much more besides including the latest reports for 29 of the very best racing tipsters we monitor for SBC members. > Huge Tipster Discounts. We negotiate special deals on behalf of our members, which means you save £££s on the cost of signing up to the best tipsters. Often you can save more than the cost of an SBC membership alnone! > Key Facts Pages For Every Tipster. All of the 29 horse racing tipsters we monitor has its own Key Facts Page with 10 different ratings covering everything from cost to odds availability to profitability. > Best Buy Tipster Tables. At a glance tables to help you find the best tipsters across a range of comparative measures. Helping you quickly and easily identify your best tipster! You can pick up your copy of this report, the instant you join our service at the Smart Betting Club with full access to our exclusive members-only area.Not only this but as an SBC member you can also gain full access to our monthly Betting Magazines, Practical Punter Reports & enjoy the peace of mind of our Money Back Guarantee if not satisfied once joining! To help you with your punting this football season, I have put together an easy to follow guide featuring 6 simple steps to achieving BETTER football betting profits. Each of the 6 steps is based on advice supplied by the football experts interviewed in our recently released ‘Essential Football Betting Compendium‘ – the same experts with proven track records beating the bookies. Suffice to say, they know what they are talking about! It is by no means a definitive guide (you will need the Compendium for that!) but its full of salient and logical advice that will keep you on the profit straight and narrow this season. It is absolutely vital to always make sure that you have set up a proper, standalone betting bank containing the funds you need for your betting. Do not mix this with the money you need to pay bills or for day to day living. The secret to successful betting is discipline, and doing this will set you on the right path from the moment you place your very first bet of the new season. Winning bettors don’t look for winners. They look for value. It is value that provides your profit. Sure, backing Man United at home against the bottom team will give you a winner more likely than not, but do this every week at the wrong prices, and you’ll lose money. This might mean you have to go against the crowd and place a bet no-one else seems to be – yet often that might just be what makes you successful. There is such a temptation to ditch a tipster when they go through a losing streak. Don’t. Form is temporary and class permanent. And you need to remember this and not fall into this very common trap. This is why the tipsters we recommend are proven, long-term winners and we don’t react to shorter periods of bad form. When a losing run hits, you will be comforted by the fact you can look at the service’s excellent results over many years betting. You will see they have experienced and worked their way through similar bad patches in the past and that they know what they are doing. So when you’ve settled on a tipster, make sure you give him the time to make you money. Stick with him, and reap the rewards. A golden rule of betting is to never put all of your precious eggs into just the one basket. Put yourself into a situation where if a tipster specialising in one field is struggling, then a tipster specialising in another can balance things out. Of course that is all very well, but surely finding one great tipster is difficult enough, never mind identifying a number of them!?! Well, it’s not difficult if you know where to look. We currently have 15 football tipsters that we have proofed, analysed, reviewed and monitored. These include ratings-based tipsters, and tipsters who specialise in one of Italian, Spanish, South American, Scottish, and UK Non-League football, amongst others. So spread the risk and boost your profits. Don’t take odds of 11/10 against your fancy when you can get 5/4. It may be small margins, but over a season, these differences will add up and make a big difference to your bottom line. There are many odds comparison sites out there, and it is a simple task to open accounts with different bookmakers and betting exchanges. Don’t be loyal to a bookie just because its easy – it might cost you! Shop around and play the market for the best odds. AND FINALLY, TIP 6: JOIN US HERE AT SBC! Best of all, for genuine advice and expertise, make sure you sign-up for a Smart Betting Club membership as we firmly believe we can help you make your betting a success. Whether you are a relative newcomer or time-served gambler, we have something to suit you – tipsters, systems, strategies, expert interviews…you name it – we feature it! And if you liked the steps above, you can find a lot more to help your football punting with our 6 part new season betting compendium – available to access and download the instant you join us. So why not try us out today risk free with our 100% money back guarantee and see how we can help you. To continue our 2015/16 football season investigations, we have spoken with another popular exchange, Matchbook on why so many punters are now using them for their betting. With a whole host of new football markets added to their site (Including League 1 & 2 in England), increased stability, and some very competitive commission rates and odds, it is easy to see why Matchbook are becoming so popular. New Customer Bonus: Open up a new Matchbook account today and enjoy a 200% bonus on bets up to £150 placed on the Premier League winner. SBC: First off, can you explain why punters should consider betting with Matchbook? Matchbook: The advantage of a betting exchange over a sportsbook for the customers is that we want our users to win. The customer is not betting against Matchbook, so we want to ensure that they have the most positive interaction with the site as possible. The content we provide onsite helps bettors to manage their bankrolls and improve their betting strategies, ultimately making money for the punter. On top of this, we are consistently best price on Soccer, NFL, NBA, NHL and various other sports, as confirmed by Oddschecker. In addition, if you don’t like the price we have on offer, you can always offer your own! SBC: Similar to other exchanges, you charge a commission to punters using your site – what are your current commission rates? Matchbook: We charge 1% (1.15% for UK customers) commission on a volume basis. At times we run special commission offers such as 0% on football, tennis, rugby etc. SBC: Can you outline what new football leagues Matchbook will be covering this season? Matchbook: We’re constantly adding new leagues to the site; just recently we’ve added leagues from Japan, China, Norway, Sweden, Finland, Iceland and Ireland so our repertoire of leagues/competitions is increasing constantly. With all of our usual markets for the major world leagues returning for the upcoming season, we have the best selection of leagues ever available on Matchbook. SBC: The amount of money traded or liquidity on any betting exchange is crucial – just how has this improved on Matchbook since we spoke last September? Matchbook: Liquidity continues to improve on Matchbook every year. Every league and market we introduce adds to our product. The last 2 months of last seasons domestic football season showed a 59% increase in volume from the previous year. We are continually improving our live tennis offering, and soon we will offer live betting on every tennis game. For cricket we have a very strong in-running product for all major tests/ODI’s and T20’s, and for politics our US Presidential market promises to be our biggest political betting event ever. SBC: Many shrewd punters use odds comparison sites to find the best odds – which sites do Matchbook appear on? Matchbook: We are operational on a variety of odds comparison sites including Oddschecker, Oddsportal, and Betbrain. You will find we are frequently best priced on a variety of major betting markets, especially soccer, tennis, and the major US sports. SBC: How about betting on the go – What do you offer in terms of mobile phone and tablet betting? Matchbook: We offer an app for iOS and Android users. Our iOS app has been redesigned for the new season and the early feedback has been fantastic. It also contains our own proprietary casino integrated into the App. SBC: Stepping away from football, what new developments are there on Matchbook? Matchbook: A host of new markets have been added to Matchbook recently with Darts, Snooker, Cycling, Politics, Gaelic Football, and Hurling among our most recent introductions. Another feature we have been Beta testing in recent times is a group betting, or Syndicate promotion. The Matchbook Syndicates can be described as a group of customers who will form a syndicate and professional sports bettors or selected members will bet on behalf of the group. This project is still in a beta phase, but promises to be a very exciting development as we grow our community. And of course, Horse Racing will be introduced in 2015/16, so a lot of work is being put into making sure we have the best horse racing product on the market. These are just a few of the features expected on site in the coming year, not to mention a host of smaller features and functionality that will make it as easy as possible for users to access the liquidity and place their bet. SBC: The Horse Racing market will attract a lot of interest I am sure, can you tell me anymore at this stage? Matchbook: Launching an industry leading exchange horse racing product does not come without its challenges. We are very determined to maintain the quality of our product when we add Horse Racing, or any other feature to our platform. So there is a lot of work going into ensuring the quality of our horse racing product measures up to the existing markets and events we cover. We are working to have a horse racing offering in place for early 2016. It’s an exciting time for the company and we’re confident our horse racing product will be a huge success when it arrives. SBC: I note you have also added new Lounge and Forum areas, can you explain what they offer? Matchbook: The Matchbook Lounge is a proprietary webspace wherein the Matchbook community can develop and grow. As the content hub of the Matchbook website, the Matchbook Lounge provides us with a space wherein we can provide relevant, topical, thought provoking and interesting betting content to our users, providing customers with a positive user experience every time they visit the site. The interactive aspect of the Matchbook Lounge allows us to leverage the peer-2-peer community of our betting exchange by enabling our customers to discuss and interact with each other. The Matchbook Forum is a key component of the Lounge. The Forum allows users create their own trading content, from discussion threads to trading strategies and tips. The Forum also enables traders to create polls and provide feedback to Matchbook.com on how to further improve their exchange betting experience. We’re looking at adding tons more personalisation to the Lounge also, allowing for each customer to receive their own unique Matchbook experience. Customised Twitter feeds, betting previews, and Forum content are some of what each customer can expect. Payment rating of 1.1 or greater – Matchbook absorbs processing fees. Payment rating of less than 1.1 – Processing fees passed to Customer. Payment processing fees will be charged at 2% on the requested withdrawal amount. You can read about the maths behind the Payment Rating here, although it is fairly complex so is best obtained by contacting Matchbook support via email or live chat to obtain yours. Matchbook tell me that they are working on making a Payment Rating calculation more easily available to customers – hopefully as part of the ‘Account’ section. In general, your Payment Rating is greater the more you bet and less you withdrawal. Thus if you intend to withdraw money on a regular, perhaps weekly basis, you may find yourself with a lower rating. Our advice is to contact Matchbook if in any doubt about your Payment Rating and if at lower than 1.1 to follow the steps they will outline on how you can improve it. If you are a horse racing fan, you might well feel a little bit left out lately with so much focus on the start of the new football season and the release of our ‘Essential Football Betting Compendium’. Yet in actual fact, there is so much going on for Smart Betting Club members who like a bet on Horse Racing including some fantastic new free tipsters and our Britain’s Got Tipsters contest, that it is well worth a full update today. Jason is an excellent racing tipster with fantastic pedigree as since October 2014 he has put up 1499 bets and made a 581 pt profit at a ROI of 16.14% (view more at the Racing Proofing website). Since July 2015, Jason has been posting all his tips on the SBC forum and from today is also sending them via email to SBC members each morning. As an SBC member you can now follow all of his advice for free – an offer certainly not to be missed! We regularly invite expert tipsters to prove themselves by posting their tips on the SBC Forum, which is exactly what the guys over at Cromwell Racing Consultants have agreed to do throughout August and hopefully beyond. They come highly recommended with a year of profitable tipping behind them and are currently being tracked by us ahead of a full SBC review. Since the 3rd August they have tipped up a string of winners via the SBC forum, culminating in the winner ‘Gworn’ yesterday which won at an advised 6/1. So far their stats read: 18 bets, £810 staked and £474 profit to a ROI of 58.52%. As an SBC member you can follow each of their tips every day via the SBC Forum. Back in June we launched our unique Britain’s Got Tipsters contest to try and find the best as-yet-undiscovered racing tipster expert, with the prize of a contract to supply tips to SBC members for the eventual winner. SBC members can follow each of the 10 contestants remaining in the contest and all of their daily tips via our forum and already a few of them are performing very well indeed. Here are the current top 4 tipsters who between them have put up 946 tips, made 89.3 pts profit and all at a ROI of 15.21%. You can follow all the tips from each tipster in the contest until its conclusion at the end of September all via the SBC Forum. To help you keep track of the best tipsters, you can also find weekly updated spreadsheets and tables for each of the contestants. The Northern Monkey is without doubt one of the most popular racing tipsters amongst SBC members and it’s easy to see why. It’s a supremely easy to follow service with first class customer service, all of which combined with the 12.1 ROI generated since February 2010 on their bets, makes it a firm SBC member favourite. Best of all, SBC members can now sign-up at anytime to enjoy a free 2 week trial with them as part of the many Tipster Savings we negotiate on their behalf. We highlighted this trial offer at the end of June, which was particularly good timing as the service enjoyed a fantastic July, with a 44 pt profit (46.7% ROI) from 107 bets advised in July. With a profit banked in each of the last 4 months, the service is bang in form and certainly one to check-out! All of the above is now available to you as a Smart Betting Club member as part of our quest to help YOU make money from your betting. There are a number of membership options now available to you, which also include the option to join with a full 30-day money back guarantee if for any reason not satisfied with our service. Better than Betfair? The betting exchange offering low commission & good football odds! As part of our preparation for the new football season, we spoke to the betting exchange, Smarkets, to get the very latest on their service and just why punters should consider them when football betting. With some extremely competitive odds, 2% commission rates on winning bets only and a wide range of markets on offer, they are fast becoming the must-have betting account for punters everywhere. 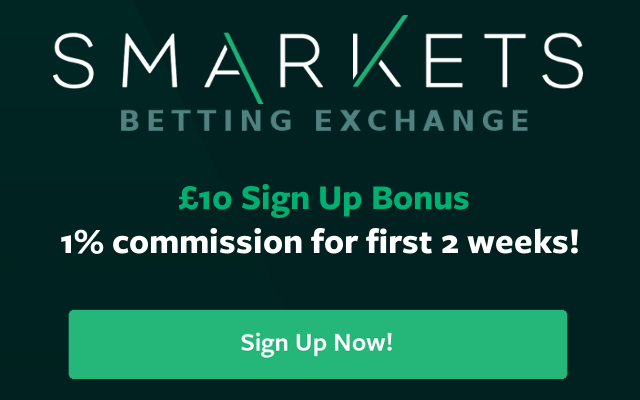 Special 1% Commission Deal: The great news is that as an SBC reader, you can pay 1% commission on your first week of betting with Smarkets PLUS enjoy a £10 risk free bonus. Click here to open a new Smarkets account. SBC: First off, can you explain why punters should consider using Smarkets? Smarkets is the smart choice for price sensitive customers. We offer the lowest industry commission, only on winning bets, and this allows us to consistently offer the best odds on any market we offer. As a quick comparison of how you would be better off at Smarkets let’s compare the odds for the top 5 to win the premier league title at a selection of bookmakers and Smarkets (odds correct at the time of writing this interview). We are offering the best odds on Chelsea, Man City & Liverpool, even when you account for our low commission, which is on winning bets only. SBC: What are your current commission rates? Smarkets customers pay a flat 2% commission on all winning bets. Customers who sign up through the Smart Betting Club do have a special deal though and receive a week at 1% commission, along with the £10 risk free bonus. This applies to your first week of bet settlement. SBC: Can you remind readers of the football markets you offer? We’re really excited about the start of the new football seasons across Europe. Smarkets offers all the biggest leagues in the world, all the way through the Conference in England with all the regular markets like over / unders, correct score and of course 1×2. The bigger the league, the more liquidity will be available, but football and horses are our strongest areas and we intend to keep it that way. SBC: What new leagues or markets are you offering this football season? We’ve just added the Premier League winner and relegation markets, and the Championship outright winner market as well. Customers backing long term markets at a bookmaker aren’t going to see a return for up to 9 months, but trading at Smarkets lets you get in and out of the market and take profit throughout the year without tying your bankroll up. SBC: One concern punters have with exchanges is the amount of money or liquidity available in your betting markets. How does that stand up on Smarkets? Liquidity is always improving, we are growing at an incredible rate and with more customers comes more liquidity. We’re especially strong on football and horse racing, but customers should have no trouble getting their trades on and matched in most sports. Essentially we want people to know that they can bet with confidence with Smarkets, that their bets will be matched (at reasonable odds of course!) and that our in-play offering has improved immeasurably since the start of the last football season. SBC: How exactly have your in-play markets improved? Since the start of last season in-play has seen a huge lift in liquidity which makes it quicker and easier to get bets down on during the match. We’ve also cleaned up the interface and added a play tracker that shows you which team is attacking, defending and key moments. SBC: How about betting on a mobile or tablet with Smarkets? You can use your mobile or tablet to bet with Smarkets. There is an android app available and we’re working on IOS at the moment. There’s also a great mobile version of the site that’s compatible with most handsets and gives you the same great value prices as the desktop site. SBC: Another concern for exchange punters is site stability, something Betfair continually suffer from a lack of. How stable is the Smarkets website? SBC: What other developments are new on Smarkets since we last spoke? There’s been massive investment in the development team to ensure the site is able to cope with the huge upturn in customers and traffic we’re seeing. With every new customer there is more liquidity in the markets and that’s part of the service we want to provide to everyone. SBC: Finally, can you explain how the £10 risk free bonus works for new customers? The sign up offer is £10 risk free following an initial deposit of £20 or more. It’s probably the simplest bonus available at any site! Just start placing your trades and the bonus automatically refunds your first £10 in losses, direct to your account, in cash. We run promotions throughout the year (Wimbledon Men’s Final tickets was a big one over the summer), and this season will be no different with plenty planned to give value back to our customers. The new football season is nearly upon us. The television companies are cranking up the hype, there are pull out guides galore, and football bettors the world over are full of hope and optimism as they prepare for the imminent battle against the bookmakers. Is the beginning of the season not a tricky time for football bettors? There is no form to go on. Teams are still wheeling and dealing in the transfer market. Players are not all properly match fit. You’re backing a team that has lost all their pre-season friendlies, etc. etc. On the face of it, there are a lot of reasons why so many bettors believe it wise to wait a few weeks before putting on their betting boots. Give it a few weeks for the form to settle down, for new players to settle in, for squads to be finalised before the transfer window closes. But what if we consider that to create an edge in the betting markets we need to go against crowd thinking? This is what the best gamblers do, and the best betting systems…and we believe our Fink Tank Systems are amongst the very best! Back in our 2013/14 Season Fink Tank System Guide, we highlighted a potentially interesting area of strong performance – the fact that first few rounds of the season had generated particularly good profits. At the time we said “profitability to date has been excellent (ROI 19.2),” but we suggested we needed “to see if the early season pattern holds up over a larger sample size as we gather more results this season and beyond”. With two more seasons under our belt, we returned to this analysis in our 2015/16 Fink Tank Guide, and found that our theory that the first six weeks of the season are very profitable indeed was bang on! As you can see from this table, in total there have been 449 bets that qualify, which have generated a profit of 103.4 points at an outstanding 23% Return On Investment!!! Some seasons have been better than others but there is a clear pattern of strong performance over a pretty solid number of bets. Those of you skipping the first six weeks of the season with this system are clearly missing out! Why does The Fink Tank do so well, when everyone else is running scared? In these early games, the Fink Tank Systems have to rely more on data from the previous season, and it would appear that they do this to great effect. One possible theory to support this finding relates to the early season hype we traditionally see both in the media and with supporters. Whilst longer-term evidence suggests most teams see only modest changes in their accumulated points and league position from one season to the next, perhaps the market over-reacts to the excitement of the summer signings and ongoing transfer talk during those opening weeks of a new season. Certainly this would explain why the Fink Tank Systems are so powerful at this early stage of the season. It’s like we said above, it’s the ability to go against the crowd that creates an edge. From what we’ve seen, our Fink Tank Systems do this perfectly! Beyond the first six weeks – how much money can I make through the season? We feel it is essential to sign up to our exclusive Fink Tank Systems before the new season gets underway, so that you can take advantage of what has proven to be a particularly lucrative first six weeks of the season. But what about the rest of what is a long season? We’re sure you don’t want to make a load of profit at the beginning of the season, and then lose it all over the remainder! How do I get access to The Fink Tank Systems? You can now follow the Fink Tank exclusively with the SBC during the 2015/16 season, via our new Fink Tank Football Betting Service. By signing up you will receive all the best value bets highlighted by the powerful Fink Tank ratings including all the bets from our four systems, every Friday and Monday of the season. What’s more – those of you with either a Gold or Platinum SBC membership can save up to £50 on the cost of following the Fink Tank this season. If keen to get started, the first Fink Tank bets are coming this Friday at Midday so make sure you sign-up right away to avoid missing out! Full details can be found at the Fink Tank Football Service page.